Six-month-old Gabriel Blaney was thrown 25 feet from his mother’s car on Thursday night when the car failed to stop at a stop sign. What could have ended in a heartbreaking tragedy ended up being a miraculous story that defies all odds. Gabriel’s mother, 18-year-old Chynna Blaney, was driving to her mother’s house along Ledgehill Road in Raymond that night, a route she doesn’t normally take. Capt. Don Goulet of the Cumberland County Sheriff’s Office said that the new mom was fiddling with the volume on her GPS unit and didn’t see the stop sign ahead. As her car approached the intersection, she realized she wasn’t going to be able to stop on the slick pavement. “There was a stop sign that I was slowing down and I wasn’t going to make it. I looking to make sure that nothing was going to hit me and at that time, the car was hitting me,” Chynna told ABC News. Having just picked up her sons, ages 2 and 5, at preschool Angie Horler, was driving south in a 2003 Ford F-150 pickup truck when she saw the 1999 Toyota Corolla at the last instant but couldn’t avoid the crash. The impact crushed the front of the pickup and tore the rear driver’s side off the Toyota. 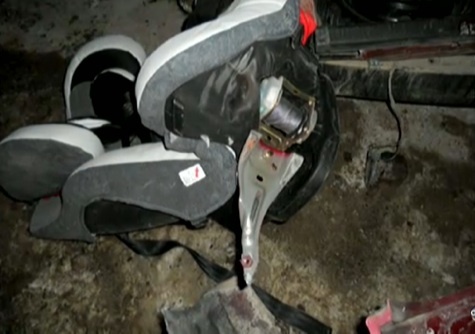 Chynna’s mutilated car had came to a stop along the side of the road. As she tried to catch her bearings, she heard the woman of the truck yelling. “I heard the lady yelling ‘There was a baby. I think the baby flew out the window.’ Then I realized,’ Oh my God, my baby’s not in my car anymore,” Chynna said. During the impact, Chynna’s son had been ejected from the car. 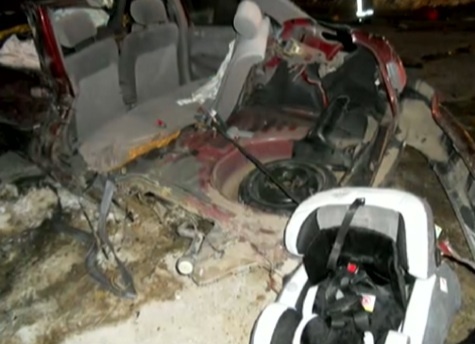 Though his safety seat had been secured properly in the car, the seat belt that had held the car seat in place gave out and completely detached from the seat. 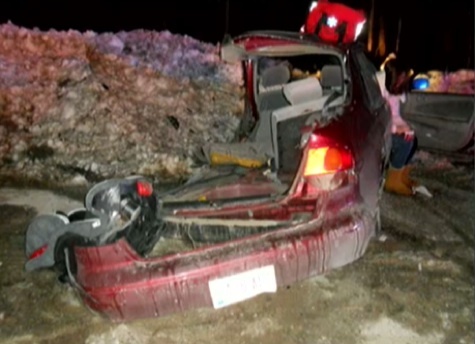 Though injured herself, Chynna got out of the car and started to search in the surrounding snow for her son. “I was yelling, ‘Where’s my baby.’ I couldn’t find him and I couldn’t see him,” she said. Gabriel had been thrown 25 feet from the car. 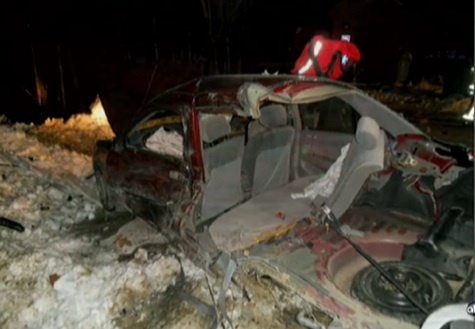 The driver of the truck would be the one to find Gabriel, face down in a snow bank. The truck driver, who has two sons of her own, picked the baby up and held him. “And I saw that the lady had him and she was sitting there crying,” Chynna said. Chynna and her son were transported to a local hospital for treatment. Gabriel’s grandfather, Harold Blaney, came to see them some time after they were admitted. Chynna and Gabriel have since been released from the hospital. And for now, she and her father are simply grateful for having walked away from this alive. “Very thankful. Very grateful. Lucky,” Chynna said.